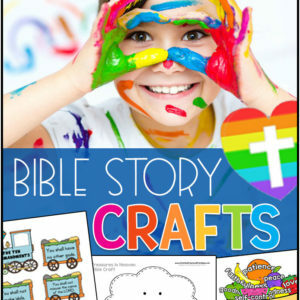 Free Christmas Bible Crafts, Christmas Activities, Christian Christmas Printables, Games, Puzzles, Lessons, Songs and more! 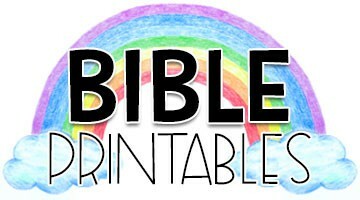 Print what you need for your Christmas Bible Lessons. 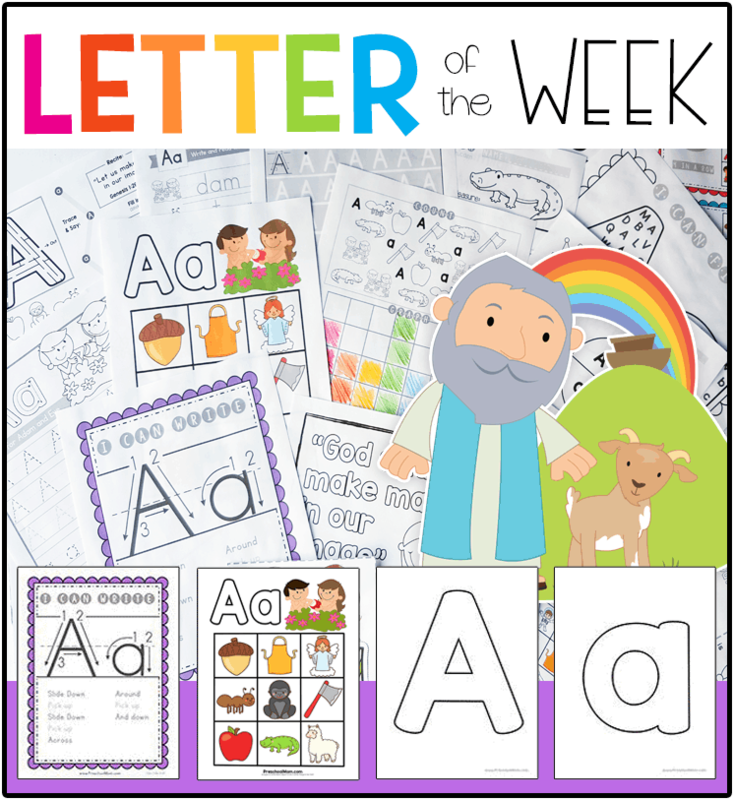 Free for Sunday School, Children’s Ministry Groups, Outreach, Mission Trips and Homeschool! 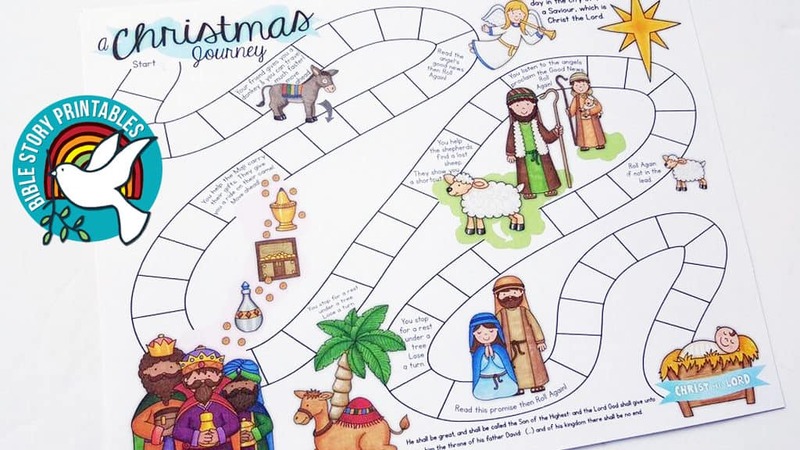 The free preschool printables we offer are perfect for your Christmas themed lesson planning and can easily be combined to create your entire unit. 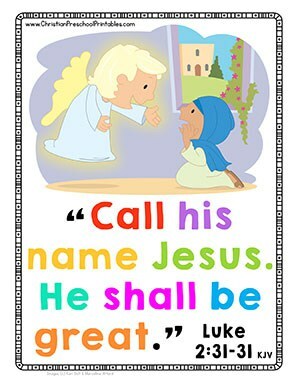 In addition to Christmas Bible Coloring Pages, we’ve also added a set of Christmas Bible Verse Cards. These are great to hang in the classroom, or to review during circle time. 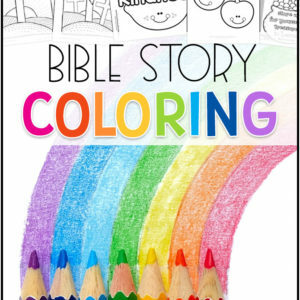 Each page includes a colorful visual alonside colorful text for students to read. 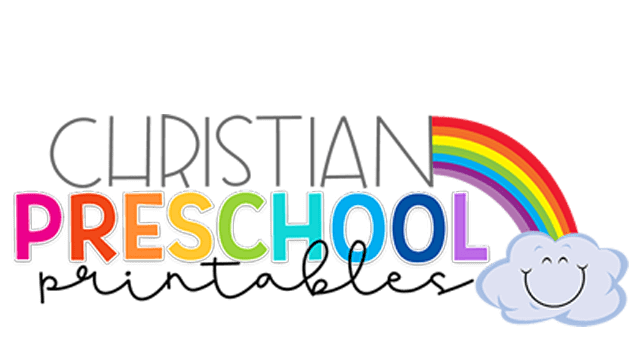 Adjust your printer settings to print multiple pages per sheet to make your own set of Christmas Bible Verse Flashcards, and send a set home with each of your students. This is a colorful picture of the the angel Gabriel visiting Mary and giving her the good news. "Call his name Jesus, he shall be great." 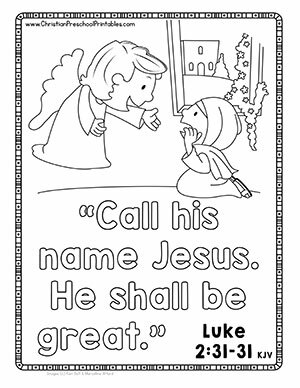 This is a coloring page of the the angel Gabriel visiting Mary and giving her the good news. "Call his name Jesus, he shall be great." 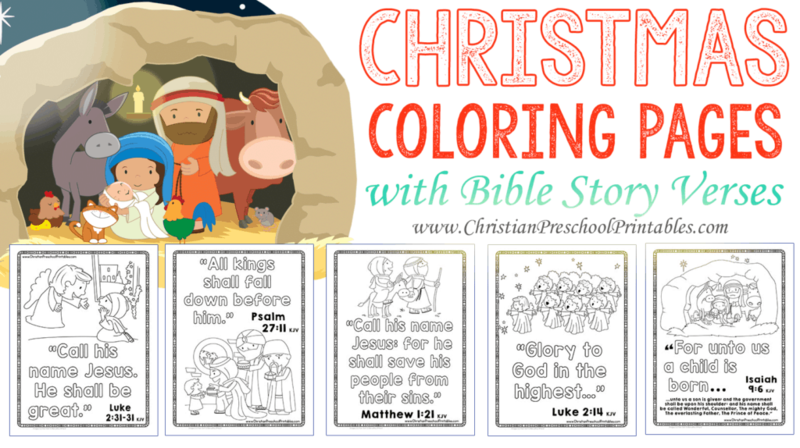 This is a colorful Bible verse chart showing Mary and Joseph traveling to Bethlehem. 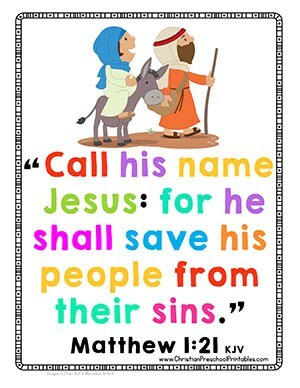 The verse reads, "Call his name Jesus: for he shall save his people from their sins." 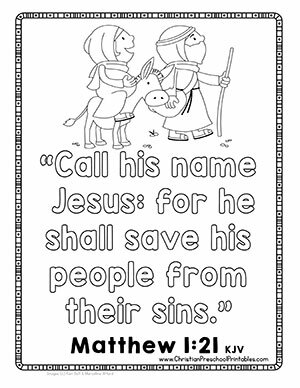 This is a Bible verse coloring page showing Mary and Joseph traveling to Bethlehem. The verse reads, "Call his name Jesus: for he shall save his people from their sins." 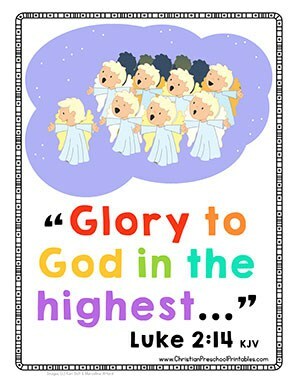 This is a colorful Bible verse chart showing the nativity scene in Bethlehem. The verse reads, "For unto us a child is born..." and continues for children to to read. 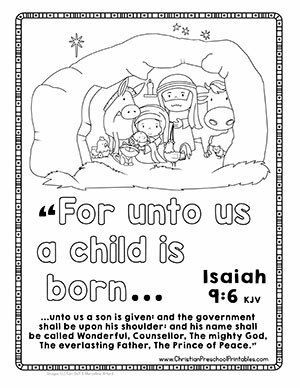 This is a Bible verse coloring page showing the nativity scene in Bethlehem. 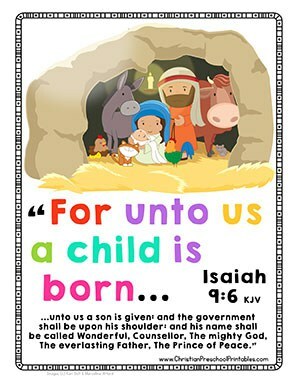 The verse reads, "For unto us a child is born..." and continues for children to to read. A Bible verse chart of the Angels announcing the birth of the Savior to the shepherds in the fields. "Glory to God in the highest." 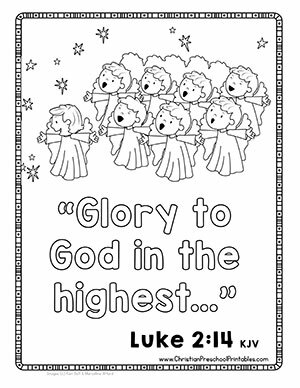 A Bible verse coloring page of the Angels announcing the birth of the Savior to the shepherds in the fields. "Glory to God in the highest." 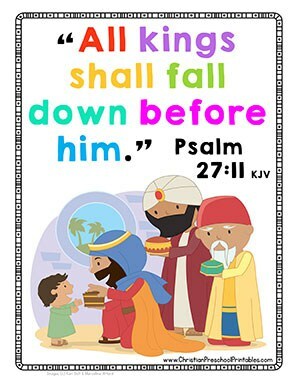 A full color Bible Verse chart depicting the three wise men bringing gifts to a young Jesus. "All kings shall fall down before him." 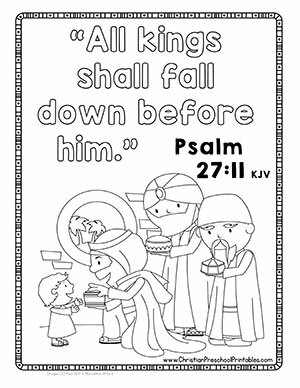 A Bible verse coloring page depicting the three wise men bringing gifts to a young Jesus. "All kings shall fall down before him." 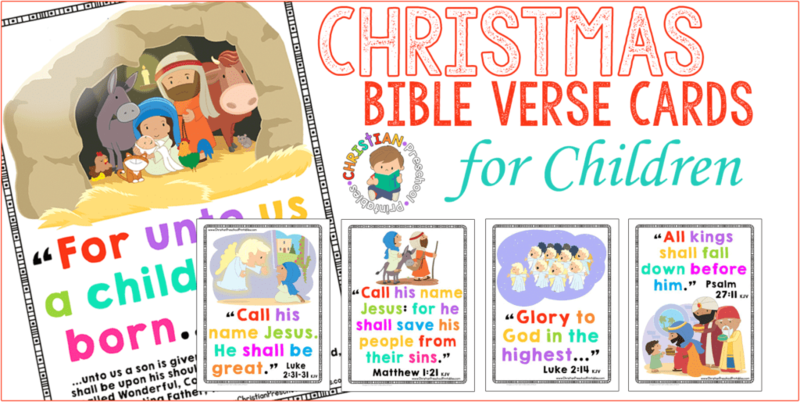 Find more Christian Christmas Printables in our Christmas Bible Activity Pack! 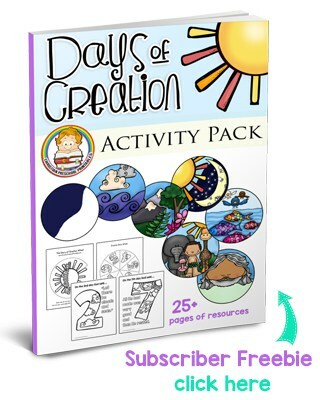 This multi-age resource pack includes games, crafts, worksheets, songs, puzzles, mazes, and so much more! 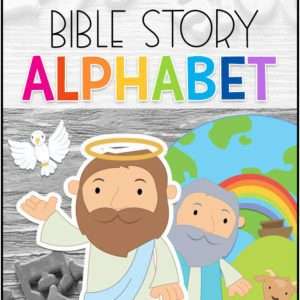 The perfect addition to your Christmas Bible Lessons.